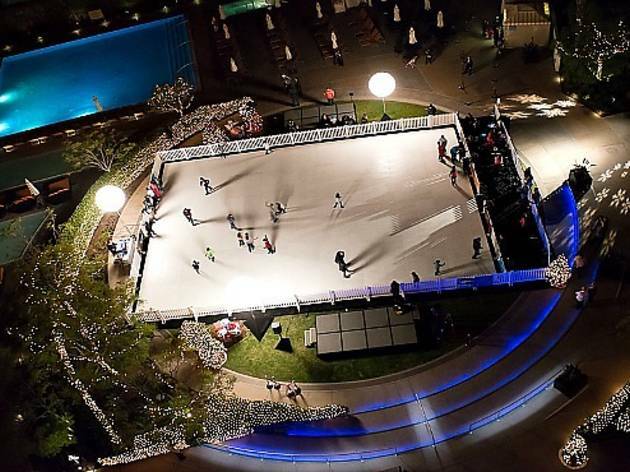 After holiday shopping at the Westfield Century City mall, head across the street to this hybrid-ice rink, located at the towering Hyatt Regency Century Plaza hotel. The Rink's surface is actually a synthetic hybrid, so no bundling up is necessary. Glide on the eco-friendly alternative to ice, similar to a slippery plastic, while listening to live music. There's also wintry comfort foods, from a build-your-own mac 'n' cheese with all the toppings to an easy-to-eat s'mores in a jar, courtesy of the $5 bites menu. Also on-hand are winter libations ($10) such as the naughty hot cocoa and candy cane cocktail. 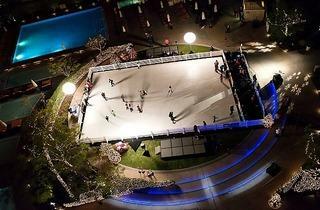 Guests at the hotel can skate for free, and the space is also available to rent out for private events. Parking at the hotel is not included in the admission fee, so it may be best to snag a spot at the mall and walk over, but let's keep that little hint between us.